Offering hay to your guinea pigs by spreading it on the floor of their cage is perhaps the most straightforward solution to dispensing hay. Just take care not to let any wayward strands land in your piggy's eye when you're giving them some! 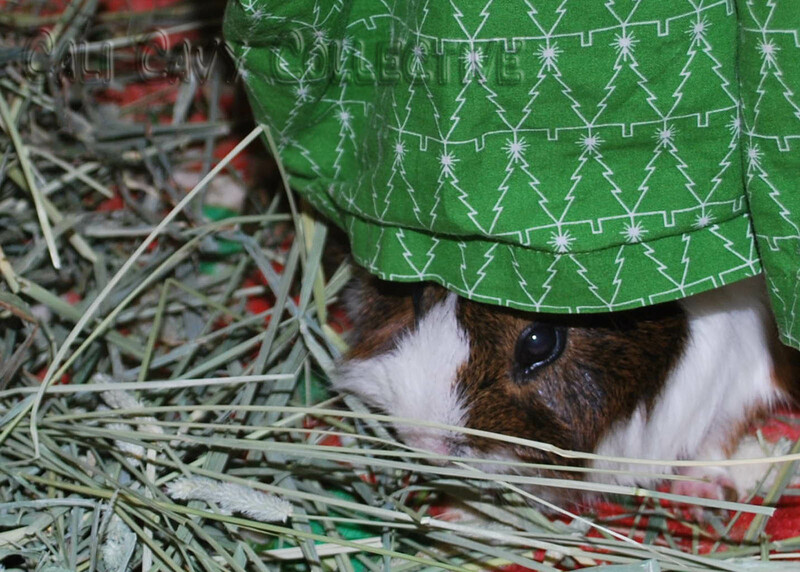 Whether you spread the hay on the floor of your cavy's cage, or give them a pile and let them muss it up themselves, this method encourages your pig to use his or her natural foraging instincts. 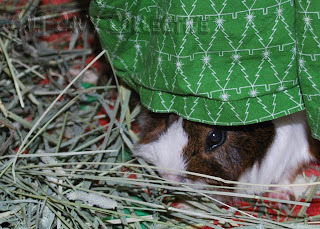 Rearranging the hay as they see fit can provide hours of fun as your piggy plays and hides in it. Many also enjoy nesting or napping in the hay, like Coppy in the photos below. 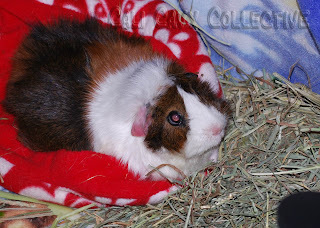 Since hay is more accessible in this manner, this is well suited for ill or elderly piggies whom may have trouble yanking at hay racks. While this may be fun for piggies, it is not necessarily the case for human caretakers! 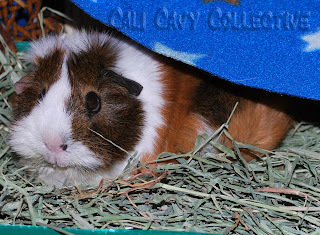 Our humans found it hard to keep our cages tidy with this method since we tend to spread the hay everywhere. Consequently, spot cleaning was more difficult. Odor-emitting damp hay was also a problem. But most importantly, we must mention that having hay all over the place makes it difficult to track poop and urine output, which is important for monitoring your piggy's health! Changes in feces can indicate an illness - for example, blood in urine is usually an indicator of bladder stones or a urinary tract infection. Needless to say, we did not decide to use the hay-on-the-floor method for regular feedings, but it certainly is fun to play in every so often! Lazing comfortably in the cuddle cup while leisurely nibbling on hay - Coppy has the best of both worlds!